Dozens of artists are creating a 24-hour sanctuary in the Scottish wilderness – an escape into digital darkness and a temporary alternative reality. I’m getting pretty excited about the second-ever Sanctuary public art event. Taking place in the heart of the Galloway Forest Dark Sky Park on 26th and 27th September. Miles from the nearest town, with no mobile signal or mains power, it’s a chance to swap the corporate and consumer universe for something fresh and exciting. Sanctuary will explore ideas about dark and light in dozens of inspiring ways. Jo Hodges, co-curator of Sanctuary, said: “Sanctuary really seems to have caught people’s imaginations. It’s a chance to find out what the possibilities are when people come together in a dark space, miles from anywhere. Entropy Lure: No matter how much of the outside world people leave behind when they enter Sanctuary, there is something they can never shed. Scientist Graham Rooney and video artist John Wallace will use the latest thermographic camera technology to capture every visitor’s unique heat signature. Nightlight-2: In direct contrast, artists Carrie Godsiff and Johannes Meyer of Unicorn Diagram will be setting up a shadow catcher. This will project people’s shadows in layer upon layer on a screen, capturing a multitude of brief moments in time. Dark Outside FM: A site-specific radio station broadcasting previously unheard music donated from all round the world. The station, curated by Stuart McLean (aka Frenchbloke) can only be heard in the forest, and when the event ends, the sound files are erased (BBC Radio 6 www.bbc.co.uk/programmes/p02t5k57). Eternal Silence: If you could send a final message to the universe what it be? Eternal Silence, by Jamie Clements and Nick Millar, will use a powerful light to beam people’s words out towards the stars. The messages will use old-fashioned Morse code, but in the spirit of the Twitter age, they will be a maximum of 140 characters. Last year’s event attracted visitors and artists from all over the country and beyond – among them Drokk, with Geoff Barrow of Portishead. In 2015 visitors can interact with the landscape in new ways through experimental works that explore darkness, light and place. 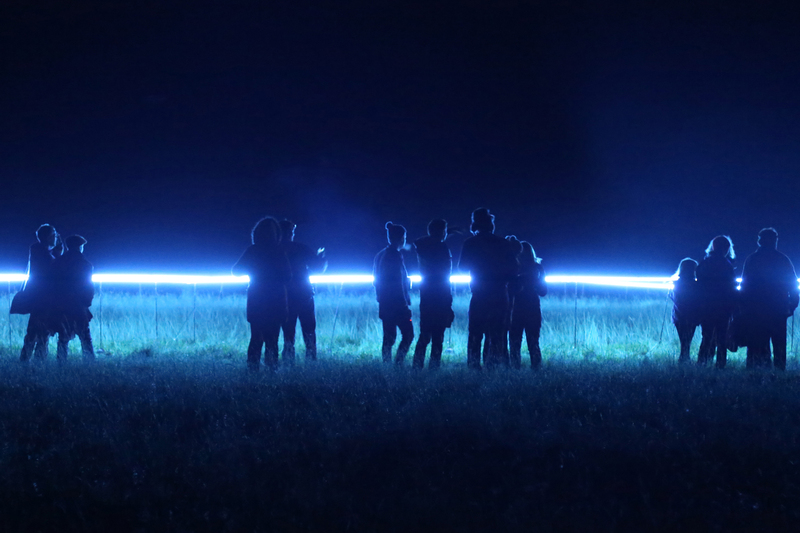 There will also be another chance to see Enclosure, the event’s signature 100ft circular blue neon light installation, by co-curator Robbie Coleman. There will also be talks about astronomy, the subversive use of modern creative technology plus the chance to build a home-made rocket and to learn about night photography. Sanctuary is free. There is camping overnight on 26th September and a food stall will be in place on Saturday day and evening and Sunday morning. Bring a torch and a radio. The Galloway Dark Skies Park is a specially designated area that is low in light pollution and Sanctuary, now in its second year, takes place within the park. Remote, beautiful and ‘electronically dark’, It is a sanctuary from both light pollution and worldwide connectedness.